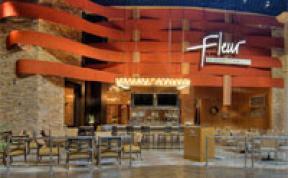 One of the signature restaurants at Mandalay Bay, Fleur by Hubert Keller offers globally-inspired smaller plates in the tapas style, but with much more far-reaching ingredients. Meant to be passed around the table, the plates are packed with flavor. Influences from Spain, Italy, North Africa, South America, Asia, and Keller's homeland France can be found throughout the menu, and the setting inside is casual yet chic, relaxed yet refined, and 100% Las Vegas dining.